Originally from the United States, Stephanie Hanrahan came to Australia for 3 years to complete her PhD at The University of Western Australia in the area of attributional style in sport. She forgot to go back to the USA. After 15 months at the University of Otago in New Zealand, Dr Hanrahan joined the academic staff at The University of Queensland in 1990. 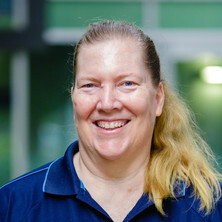 She was a UQ Teaching Excellence Award winner in 1997 and is currently an associate professor holding a joint appointment with the School of Human Movement and Nutrition Sciences and the School of Psychology. Stephanie is a fellow of the Australian Sports Medicine Federation, the Association for Applied Sport Psychology, and the Australian Psychological Society. Her intervention programs that combine physically active games with mental skills training have been shown to enhance the life satisfaction, self-worth, happiness, and resilience of marginalised adolescents and young adults. Doing exercise psychology. Edited by Mark B. Andersen and Stephanie J. Hanrahan Champaign IL United States: Human Kinetics, 2015. Secrets of Asian Sport Psychology. Edited by Peter C Terry, Zhang Li-Wei, Kim YoungHo, Tony Morris and Stephanie Hanrahan Toowoomba, QLD, Australia: University of Southern Queensland, 2014. Sport for development, peace and social justice. Edited by Robert J. Schinke and Stephanie J. Hanrahan Morgantown, WV, United States: Fitness Information Technology, 2012. Routledge Handbook of Applied Sport Psychology: A Comprehensive Guide for Students and Practitioners. Edited by Stephanie Hanrahan and Mark Andersen Abingdon, Oxon, United Kingdom: Routledge, 2010. Cultural Sport Psychology. Edited by Robert Schinke and Stephanie J. Hanrahan Champaign, IL: Human Kinetics, 2009. Kidman, L. and Hanrahan, S.J. The Coaching Process: A Practical Guide to Improving your Effectiveness 2nd ed. Palmerston North, NZ: Dunmore Press, 2004. Hanrahan, S. J. and Carlson, T. B. Game Skills: A Fun Approach to Learning Sport Skills. Champaign, Ill: Human Kinetics, 2000. Hanrahan, Stephanie J. and Tshube, Tshepang (2016). Training the trainers in Botswana: the LifeMatters program tailored to community youth coaches. In J. Gualberto Cremades and Lauren S. Tashman (Ed. ), Global practices and training in applied sport, exercise, and performance (pp. 154-162) New York, NY, United States: Routledge. Hanrahan, Stephanie J. (2015). Dancing for your life: movement, health, and well-being. In Doing exercise psychology (pp. x-x) United States of America: Human Kinetics. Gaskin, Cadeyrn and Hanrahan, Stephanie J. (2015). It's about moving: enabling activity and conquering prejudices when working with disabled people. In Mark B. Anderson and Stephanie J. Hanrahan (Ed. ), Doing exercise psychology (pp. 201-2016) Champaign, IL, United States: Human Kinetics. Hanrahan, Stephanie J. (2015). Running across borders: cross-cultural Exercise Psychology. In Mark B. Anderson and Stephanie J. Hanrahan (Ed. ), Doing exercise psychology (pp. 33-46) Champaign, IL, United States: Human Kinetics. Hanrahan, Stephanie J. and Gucciardi, Daniel F. (2013). Sharpening mental skills. In Frank S. Pyke (Ed. ), Coaching Excellence (pp. 185-200) Champaign, IL, USA: Human Kinetics. Hanrahan, Stephanie J. (2013). Using games to enhance life satisfaction and self-worth of orphans, teenagers living in poverty, and ex-gang members in Latin America. In Robert J. Schinke and Ronnie Lidor (Ed. ), Case studies in sport development : contemporary stories promoting health, peace, and social justice (pp. 89-101) Morgantown, WV, United States: Fitness Information Technology. Hanrahan, Stephanie J. and Schinke, Robert J. (2012). Conclusions and future directions. In Robert Schinke and Stephanie Hanrahan (Ed. ), Sport for development, peace and social justice (pp. 263-276) Morgantown, WV, United States: Fitness Information Technology. Hanrahan, Stephanie J. (2012). Developing adolescents' self-worth and life satisfaction through physically active games: Interventions with orphans and teenagers living in poverty. In Robert Schinke and Stephanie Hanrahan (Ed. ), Sport for development, peace and social justice (pp. 135-148) Morgantown, WV, United States: Fitness Information Technology. Schinke, Robert J. and Hanrahan, Stephanie J. (2012). Sport as a possible intervention: An introduction. In Robert Schinke and Stephanie Hanrahan (Ed. ), Sport for development, peace and social justice (pp. 1-8) Morgantown, WV, United States: Fitness Information Technology. Hanrahan, Stephanie J. (2012). Using psychological skills training from sport psychology to enhance the life satisfaction of adolescent Mexican orphans. In Brian S. Nguyen (Ed. ), Psychology of satisfaction (pp. 139-152) Hauppauge, NY, United States: Nova Science Publishers. Hanrahan, Stephanie J. and Isaacs, Geogg (2011). Assessing self- and peer-assessment: The students' views. In Peter Kandbinder and Tai Peseta (Ed. ), Higher education research and development anthology (pp. 195-211) Milperra, N.S.W., Australia: Higher Education Research and Development Society of Australasia. Hanrahan, Stephanie J. and Schinke, Robert J. (2011). Culture in sport psychology. In Tony Morris and Peter C. Terry (Ed. ), The new sport and exercise psychology companion (pp. 553-566) Morgantown, WV, United States: Fitness Information Technology. Gucciardi, Daniel F., Mallett, Clifford J., Hanrahan, Stephanie J. and Gordon, Sandy (2011). Measuring mental toughness in sport: Current status and future directions. In Daniel Gucciardi and Sandy Gordon (Ed. ), Mental toughness in sport: Developments in research and theory (pp. 108-132) Abingdon, United Kingdom: Routledge. Hanrahan, Stephanie J. (2011). Sport psychology services are multicultural encounters: Differences as strengths in therapeutic relationships. In David Gilbourne and Mark Anderson (Ed. ), Critical essays in applied sport psychology (pp. 145-156) Champaign, IL, United States: Human Kinetics. Salama-Younes, Marei, Hanrahan, Stephanie J., Martin-Krumm, Charles and Roncin, Charles (2010). Children's explanatory styles and sport performance. In Teresa Freire (Ed. ), Understanding positive life: Research and practice on positive psychology (pp. 199-215) Lisboa, Portugal: Climepsi Editores. Hanrahan, Stephanie J. (2010). Culturally competent practitioners. In Stephanie Hanrahan and Mark Andersen (Ed. ), Routledge Handbook of Applied Sport Psychology: A Comprehensive Guide for Students and Practitioners (pp. 460-468) Abingdon, Oxon, England ; New York: Routledge. Hanrahan, Stephanie J. (2010). Psicologia del deporte con deportistas discapacitados. In Jose Maria Buceta and Eneko Larumbe (Ed. ), Experiencias en psicologia del deporte (pp. 836-846) Madrid, Spain: Dykinson. Hanrahan, Stephanie J. and Schinke, Robert (2009). Conclusion: So what?. In R. Schinke and S.J. Hanrahan (Ed. ), Cultural Sport Psychology (pp. 219-224) Champaign, IL: Human Kinetics. Blodgett, Amy T., Yungblut, Hope E., Schinke, Robert J. and Hanrahan, Stephanie J. (2009). Introduction to cultural sport psychology revisited. In Robert Schinke (Ed. ), Contemporary sport psychology (pp. 89-104) New York, U.S.A.: Nova Science Publishers. Blodgett, Amy T., Yungblut, Hope E., Schinke, Robert J. and Hanrahan, Stephanie J. (2009). Introduction to cultural sport psychology revisited. In Contemporary Sport Psychology (pp. 89-104) : Nova Science Publishers, Inc..
Hanrahan, Stephanie J. (2009). Using psychological skills training from sport psychology to enhance the life satisfaction of adolescent Mexican orphans. In Robert Schinke (Ed. ), Contemporary sport psychology (pp. 171-180) New York: Nova Science Publishers Inc.
Hanrahan, Stephanie J. (2009). Working with Australian Aboriginal athletes. In R. Schinke and S.J. Hanrahan (Ed. ), Cultural Sport Psychology (pp. 185-192) Champaign, IL: Human Kinetics. Hanrahan, S. J. and Biddle, S. J. H. (2008). Attributions and perceived control. In T. S. Horn (Ed. ), Advances in Sport Psychology 3 ed. (pp. 99-114) Champaign, IL: Human Kinetics. Salama-Younes, M., Martin-Krumm, C., Hanrahan, S. J. and Roncin, C. (2006). Children's explanatory style in France: Psychometric properties of the children's Attributional Style Questionnaire and reliability of a shorter version. In A.D. Fave (Ed. ), Dimensions of well-being: Research and intervention (pp. 191-206) Milan, Italy: FrancoAngeli. Hanrahan, S.J. (2005). Able athletes with disabilities: Issues and group work. In M.B. Andersen (Ed. ), Sport Psychology in Practice (pp. 223-247) Champaign, Il: Human Kinetics. Hanrahan, S.J. (2005). On stage: Mental skills training for dancers. In M.B. Andersen (Ed. ), Sport Psychology in Practice (pp. 109-127) Champaign, Il: Human Kinetics. Hanrahan, Stephanie J. (2004). Sport psychology and athletes with disabilities. In T. Morris and J. Summers (Ed. ), Sport Psychology: Theory, Applications and Issues 2nd ed. (pp. 572-583) Milton, Queensland: John Wiley & Sons. Biddle, S.J.H., Hanrahan, S.J. and Sellars, C.N. (2001). Attributions: Past, present and future. In R.N. Singer, H.A. Hausenblas and C.M. Janelle (Ed. ), Handbook of Sport Psychology 2nd ed. (pp. 444-471) New York: John Wiley & Sons. Mayocchi, L. and Hanrahan, S. J. (2000). Transferable skills for career change. In D. Lavelle and P. Wylleman (Ed. ), Career Transitions in Sport: International Perspectives (pp. 95-110) Morgantown, WV: Fitness Information Technology. Tshube, Tshepang and Hanrahan, Stephanie J. (2017) Cultural perspectives to sport psychology: experiences of working with national teams in Botswana. African Journal for Physical Activity and Health Sciences, 23 3: 498-509. Hanrahan, Stephanie J. and de Lourdes Francke Ramm, Maria (2015) Improving life satisfaction, self-concept, and happiness of former gang members using games and psychological skills training. Journal of Sport for Development, 3 4: 41-47. Serra de Queiroz, Fernanda and Hanrahan, Stephanie (2011) Helping athletes develop performance routines. Active Education Magazine, 32 58-60. Leading to inspire others: Charismatic influence or hard work? Stanimirovic, Rosanna and Hanrahan, Stephanie (2010) Psychological predictors of job performance and career success in professional sport. Sport Science Review, XIX 1-2: 211-239. Dickinson, Rebecca K. and Hanrahan, Stephanie J. (2009) An investigation of subjective sleep and fatigue measures for use with elite athletes. Journal of Clinical Sport Psychology, 3 3: 244-266. Hanrahan, Stephanie J., Pedro, Rachel and Cerin, Ester (2009) Structured self-reflection as a tool to enhance perceived performance and maintain effort in adult recreational salsa dancers. The Sport Psychologist, 23 2: 151-169. Anderson, R. and Hanrahan, S.J. (2008) Dancing in pain: Pain appraisal and coping in dancers. Journal of Dance Medicine and Science, 12 1: 9-16. Hanrahan, S. J. (2007) First grab a blank piece of paper: A sport psyschologist's tips for better golf. Sport Health, 25 1: 11-12. Hanrahan, Stephanie J. and Gross, John B. (2005) Attributions and goal orientations in masters athletes: performance versus outcome. Revista de Psicologia del Deporte, 14 1: 43-56. Hanrahan, S.J. (2005) Sport psychology: Travel tips. SportsMed News, February 4-5. Devlin, H. J. and Hanrahan, S. J. (2005) Thermal biofeedback, locus of control and precompetitive anxiety in young athletes. Journal of Human Movement Studies, 49 1: 1-29. Hanrahan, S.J. (2005) Using psychological skills training from sport psychology to enhance the life satisfaction of adolescent Mexican orphans. Athletic Insight, 7 3: 1-7. Efficacy, affect and teams: Is momentum a misnomer? Stanimirovic, Rosanna and Hanrahan, Stephanie (2004) Efficacy, affect and teams: Is momentum a misnomer?. International Journal of Sport and Exercise Psychology, 2 1: 43-62. Elite athletes: Why does the 'fire' burn so brightly? Hanrahan, S. J. (2004) Sport psychology and indigenous performing artists. The Sport Psychologist, 18 1: 60-74. Hanrahan, S.J. (2003) Psychological aspects of dance performance. SportsMed, July 16-17. Hanrahan, S.J. and Biddle, S.J.H. (2002) Measurement of achievement orientations: Psychometric measures, gender, and sport differences. European Journal of Sport Science, 2 5: 1-12. Hanrahan, S.J. (2001) Under-recovery: The real problem. SportsMed News, August 7-9. Hanrahan, S. J. (2000) Sport psychology: Part of a multidisciplinary and multicultural world. Sport Health, 18 2: 13-15. Hanrahan, S. J. (2000) Two glimpses of the Paralympics: Brendan Burkett and Gerrard Gosens. SportsMed News, August 4-5. Millard, H. C., Hanrahan, S. J. and Jackson, S. (1999) Coaching to improve athletes' performance and satisfaction. Sportsmed News, 4-5. Hanrahan, S. J. (1999) Common questions in applied sport psychology. Sportsmed News, May 2. Millard, H. C. and Hanrahan, S. J. (1999) Excessive exercise and eating disorders. Sport Health, 17 2: 16-19. Hanrahan, S. J. (1999) Helping students think for themselves. Strategies, 12 4: 11-12, 29-30. Hinton-Bayre, AD and Hanrahan, SJ (1999) Sensation seeking, physical self-concept and attentional style in elite springboard and platform divers. Journal of Human Movement Studies, 37 4: 183-203. Hanrahan, S. J. (1999) Thinking about sport and disability. Sport Health, 17 3: 20-22. Smethurst, CJ, Carson, RG and Hanrahan, SJ (1998) The effects of two different instructional sets on bimanual coordination. Journal of Sport & Exercise Psychology, 20 S56-S56. Race modeling: An effective cognitive strategy for the 100 m sprinter? Hooper, SL, MacKinnon, LT and Hanrahan, S (1997) Mood states as an indication of staleness and recovery. International Journal of Sport Psychology, 28 1: 1-12. Blackburn, M. J. and Hanrahan, S. J. (1994) Evaluation of procedures for monitoring athletes' thoughts during exercise. Australian Journal of Science and Medicine in Sport, 26 1-2: 36-41. Grove, JR, Hanrahan, SJ and Stewart, Rml (1990) Attributions for Rapid or Slow Recovery From Sports Injuries. Canadian Journal of Sport Sciences-Revue Canadienne Des Sciences Du Sport, 15 2: 107-114. Baranoff, J., Hanrahan, S. J., Kapur, D. and Connor, J. P. (2012). Factor structure of the short form of the chronic pain acceptance questionnaire. In: 10th World Conference of Association for Contextual Behavioural Science, Washington, DC, United States, (). 22-25 July 2012. Hanrahan, Stephanie J. (2009). Enhancing life satisfaction and self worth of Mexican orphans. In: Meeting New Challenges and Bridging Cultural Gaps in Sport and Exercise Psychology. The 12th ISSP World Congress of Sport Psychology Proceedings, Marrakech, Morroco, (162-163). 17-21 June, 2009. Hannan, T., Hanrahan, S., Andersen, M. and Gordon, S. (2009). Postgraduate training in sport psychology: Challenges and future directions. In: C. Finch, Journal of Science and Medicine in Sport (Supplement) Program and Abstracts - be active '09. 2009 Australian Conference of Science and Medicine in Sport - be active '09, Brisbane, (167). 14-17 October, 2009. Hanrahan, Stephanie J. (2009). Sport psychology training in Australia. In: Meeting New Challenges and Bridging Cultural Gaps in Sport and Exercise Psychology. The 12th ISSP World Congress of Sport Psychology Proceedings, Marrakech, Morroco, (108). 17-21 June, 2009. Baranoff, J., Hanrahan, S. and Connor, J. (2009). The impact of early maladaptive schema and avoidant coping in post injury rehabilitation. In: C. Finch, Journal of Science and Medicine in Sport (Supplement) Program and Abstracts - be active '09. 2009 Australian Conference of Science and Medicine in Sport - be active '09, Brisbane, (96-97). 14-17 October, 2009. Clemmet, S., Hanrahan, S. and Murray, J. (2009). Transition out of sport: An examination of the loss of athletic careers. In: C. Finch, Journal of Science and Medicine in Sport (Supplement) Program and Abstracts - be active '09. 2009 Australian Conference of Science and Medicine in Sport - be active '09, Brisbane, (100). 14-17 October, 2009. Schinke, Robert J., Hanrahan, Stephanie J. and Fisher, Leslee A. (2009). Working with participants and clients from marginalized populations. In: Association for Applied Sport Psychology - 2009 Conference Proceedings. Association for Applied Sport Psychology 24th Annual Conference, Salt Lake City, USA, (32). 15-18 September, 2009. Watson II, J.C., Etzel, E.F. and Hanrahan, S.J. (2008). Ethics in research within the field of applied sport and exercise psychology. In: AASP Executive Board, Association for Applied Sport Psychology 2008 Conference Proceedings. Association for Applied Sport Psychology 2008, St Louis, Missouri, USA, (98). 24-27 September, 2008. Berger, B.G., Hanrahan, S.J., MacCracken, M.J. and Stadulis, R.E. (2008). Influence of physical activity on subjective well-being: Diverse populations and implications for practitioners. In: AASP Executive Board, Association for Applied Sport Psychology 2008 Conference Proceedings. Association for Applied Sport Psychology 2008, St Louis, Missouri, USA, (3). 24-27 September, 2008. Hanrahan, S.J. (2008). Multicultural practice: Applied experiences at the community level. In: AASP Executive Board, Association for Applied Sport Psychology 2008 Conference Proceedings. Association for Applied Sport Psychology 2008, St Louis, Missouri, USA, (2). 24-27 September, 2008. Blodgett, A., Schinke, R.J., Hanrahan, S.J. and Yukelson, D. (2008). Multicultural sport psychology: From community to professional sport. In: AASP Executive Board, Association for Applied Sport Psychology 2008 Conference Proceedings. Association for Applied Sport Psychology 2008, St Louis, Missouri, USA, (). 24-27 September, 2008. Hanrahan, S.J. (2008). Participant feedback on an intervention to enhance life satisfaction and self-worth through games and mental skills. In: AASP Executive Board, Association for Applied Sport Psychology 2008 Conference Proceedings. Association for Applied Sport Psychology 2008, St Louis, Missouri, USA, (4). 24-27 September, 2008. Anderson, R. and Hanrahan, S. J. (2007). Dancing in pain: Pain appraisal and coping in dancers. In: Solomon, R. and Solomon, J., Proceedings of the 17th Annual Meeting of the International Association for Dance Medicine and Science. 17th Annual Meeting of the International Association for Dance Medicine and Science, Canberra, (245-249). 25-27 October, 2007. Hanrahan, S. J. (2007). Physically active games as part of an intervention to enhance life satisfaction and self-worth. In: Samahito, S., Proceedings Joint Congress 2007 SEA Games and ASEAN Para Games Scientific Congress and 5th Bangkok ASPASP International Congress on Sport Psychology. "From West to East: Bridge in Sport Sciences for Better Performance and Well-Being", Bangkok, (148-151). 1-4 December, 2007. Hanrahan, S. J., Matthews, R. and Cerin, E. (2007). Self-reflection as an intervention to influence achievement goal orientations and intrinsic motivation. In: Solomon, R. and Solomon, J., Proceedings of the 17th Annual Meeting of the International Association for Dance Medicine and Science. 17th Annual Meeting of the International Association for Dance Medicine and Science, Canberra, (145-150). 25-27 October, 2007. Kronvall Parkinson, M., Hanrahan, S. J., Stanimirovic, R. and Sharp, L. (2007). The effects of perfectionism and physical self-concept on pre-performance anxiety in elite female gymnasts, basketball players, and ballet dancers. In: R. Solomon and J. Solomon, Proceedings of the 17th Annual Meeting of the International Association for Dance Medicine and Science. 17th Annual Meeting of the International Association for Dance Medicine and Science, Canberra, (22-27). 25th - 27th October, 2007. Hanrahan, S J and Seefeld, N. A. S. (2006). A randomised control trial in sport psychology. In: C. Finch, Supplement to Journal of Science and Medicine and in Sport: 2006 ASICS Conference of Science and Medicine in Sport. Sports medicine in paradise: Perspectives from the Pacific, Yanuca, Fiji, (28). 19-21 October, 2006. Moffatt, A.C., Hurst, J.R., Sachs, M.L., Martin, J.J. and Hanrahan, S J (2006). Modeling diversity in AAASP: Extending your practice, teaching, and research to people with disabilities. In: 21st Annual Conference Proceedings of the Association for the Advancement of Applied Sport Psychology. AASP Annual Conference, Miami, Florida, (29). 27-30 September, 2006. Schinke, R.J., Ryba, T.V. and Hanrahan, S J (2006). Understanding the challenges and working effectively with marginalized populations: Recommendations for effective practice. In: 21st Annual Conference Proceedings of the Association for the Advancement of Applied Sport Psychology. Association for the Advancement of Applied Sport Psychology, Miami, Florida, (3). 27-30 September, 2006. Hanrahan, S J (2006). Working with Australian Aboriginal performers. In: 21st Annual Conference Proceedings of the Association for the Advancement of Applied Sport Psychology. AASP Annual Conference, Miami, Florida, (4). 27-30 September, 2006. Minniti, A.M. and Hanrahan, S.J. (2005). A qualitative investigation of elite triathletes' attributions: Comparisons across attribution retraining models. In: T. Morris, P. Terry, S. Gordon and et al., Proceedings of the ISSP 11th World Congress of Sport Psychology. Promoting Health and Performance for Life, Sydney, (). 15-19 August, 2005. Hanrahan, S.J. and Seefeld, N. A. S. (2005). An intervention designed to enhance task orientation and improve attributions. In: AAASP Executive Board, Association for the Advancement of Applied Sport Psychology: 2005 Conference Proceedings. 20th Anniversary Conference, Vancouver, BC, (53). 26-30 October, 2005. Anderson, R. and Hanrahan, S. J. (2005). Dancing in pain: Investigating pain appraisal and coping in dancers. In: T. Morris, P. Terry and S. Gordon, Proceedings of the ISSP 11th World Congress of Sport Psychology. Promoting Health and Performance for Life, Sydney, (). 15-19 August, 2005. Härtel, C. E. J., Hanrahan, S. and Cerin, E. (2005). Development of the task and ego orientation at work questionnaire. In: Australian and New Zealand Academy of Management Conference, Canberra, Australia, (). December 2005. Hanrahan, S.J. (2005). Games for team engagement: Having fun with a purpose. In: A. Cox, Journal of Science and Medicine in Sport Supplement. 2005 Australian Conference of Science and Medicine in Sports, Melbourne, (164). 13-16 October, 2005. Dickinson, R. K. and Hanrahan, S.J. (2005). Generalising social anxiety to sport in school PE, and the roles of motivational climate and perceived ability in predicting sport anxiety. In: T. Morris, P. Terry, S. Gordon and et al., Proceedings of the ISSP 11th World Congress of Sport Psychology. Promoting Health and Performance for Life, Sydney, (). 15-19 August, 2005. Ahlberg, M. S. and Hanrahan, S.J. (2005). Is there an "I" in "Team" after all: The moderating effects of social identity on the team cohesion-performance relationship. In: T. Morris, P. Terry, S. Gordon and et al., Proceedings of the ISSP 11th World Congress of Sport Psychology. Promoting Health and Performance for Life, Sydney, (). 15-19 August, 2005. Moderating effects of perceived team cohesion on attribution bias: Does it pay to be a member of a highly cohesive team? Patchell, J. W. and Hanrahan, S.J. (2005). Moderating effects of perceived team cohesion on attribution bias: Does it pay to be a member of a highly cohesive team?. In: T. Morris, P. Terry, S. Gordon and et al., Proceedings of the ISSP 11th World Congress of Sport Psychology. Promoting Health and Performance for Life, Sydney, (). 15-19 August, 2005. Seefeld, N. A. S. and Hanrahan, S.J. (2005). Modification of competitive attitudes and achievement goal orientations. In: T. Morris, P. Terry, S. Gordon and et al., Proceedings of the ISSP 11th World Congress of Sport Psychology. Promoting Health and Performance for Life, Sydney, (). 15-19 August, 2005. Harris, C. A., Hanrahan, S.J. and Jobling, A. (2005). Outdoor adventure and physical disability: Participants' perceptions of the catalysts of change. In: T. Morris, P. Terry, S. Gordon and et al., Proceedings of the ISSP 11th World Congress of Sport Psychology. Promoting Health and Performance for Life, Sydney, (). 15-19 August, 2005. Hanrahan, S.J. and Mathews, R.A. (2005). Success in Salsa: Students' evaluation of the use of self-reflection when learning to dance. In: K. Vincs, Conference Proceedings: Dance Rebooted: Initializing the Grid. Dance Rebooted: Initializing the Grid, Deakin University, Melbourne, (pdf-1-pdf-12). 1-4 July 2004. Hanrahan, S.J. (2005). Teaching psychological skills to Pequenos: Influence on quality of life. In: A. Cox, Journal of Science and Medicine in Sport Supplement. 2005 Australian Conference of Science and Medicine in Sports, Melbourne, (147). 13-16 October, 2005. Harris, C. A., Hanrahan, S.J. and Jobling, M. A. (2004). Altering attitudes: Perceptions of disability in a physically challenging environment. In: C. Finch, Journal of Science and Medicine in Sport Supplement: 2004 Australian Conference Program and Abstracts. Hot Topics from the Red Centre, Alice Springs, (71). 6-9 October 2004. Hanrahan, S. J. (2004). Practical considerations when working with athletes with disabilities. In: T. H. Teong, Proceedings of the 1st Regional Conference on Human Performance. 1st Regional Conference on Human Performance, Petaling Jaya, Malaysia, (). 30 November - 2 December, 2004. Hanrahan, S.J. (2004). Practicalities of working with athletes with disabilities. In: C. Finch, Journal of Science and Medicine in Sport Supplement: 2004 Australian Conference Program and Abstracts. Hot Topics from the Red Centre, Alice Springs, (107). 6-9 October 2004. Hanrahan, S.J. (2004). Psychology as a tool to enhance human performance. In: T. H. Teong, 1st Regional Conference on Human Performance. , Petaling Jaya, Malaysia, (). 30 November - 2 December, 2004. Hanrahan, S.J. (2004). Sport psychology training in Australia. In: AAASP Executive Board, Association for the Advancement of Applied Sport Psychology 2004 Conference Proceedings. , Minneapolis, Minnesota, (22). 29 September-2 October 2004. Hanrahan, S.J. (2004). Sport psychology: More than just 'that motivation stuff'. In: Conference Organising Committee, 2004 Sports Medicine Australia Queensland State Conference Abstract Book. Evidence Based Sports Medicine: Dispelling the Myths, Townsville, (). 24-25 April 2004. Hanrahan, S. J., Cerin, E. and Härtel, C. E. J. (2003). Achievement goal orientations, attributional style, and motivational climate as predictors of performance and persistance. In: Association for the Advancement of Applied Sport Psychology 2003 Conference, Philadelphia, PA, U.S.A., (44-44). 8-11 October 2003. Hanrahan, S.J., Cerin, E. and Hartel, C. (2003). Achievement goal orientations, attributional style, and motivational climate as predictors of performance and persistance. In: Association for the Advancement of Applied Sport Psychology, Association for the Advancement of Applied Sport Psychology 2003 Conference Proceedings. , Philadelphia, PA, (44-44). 8-11 October, 2003. Hanrahan, S.J. (2003). Mental Skills Training for Athletes with Disabilities. In: Il Congreso Internacional Psicologia Aplicada al Deporte: Materiales Complementarios. , Madrid, (). November, 2003. Success and failure: The same in sport as in work? Hartel, C. and Hanrahan, S. J. (2003). Success and failure: The same in sport as in work?. In: 5th Australian Industrial and Organisational Psychology Conference: Conference Proceedings. Advancing Creative Solutions in Science and Practice, Melbourne, Australia, (127-127). 26-29 June 2003. Hartel, C. E. J. and Hanrahan, S. J. (2003). Success and failure: The same in sport as in work?. In: 2003 Australian Industrial and Organisational Psychology Conference : The 5th Australian I-O Psychology conference, Melbourne, Australia, (). 26-29 June 2003. Minniti, A. M., Hanrahan, S.J. and Williams, J. (2002). Comparison of attribution retraining models. In: Organising Committee, Association for the Advancement of Applied Sport Psychology 2002 Conference Proceedings. , Tucson, Arizona, (98-99). 30 October - 2 November, 2002. Stanimirovic, R. and Hanrahan, S. J. (2002). Efficacy, affect and teams: Is momentum a misnomer?. In: The 2002 Conferences of the Australasian College of Sports Physicians, Sports Medicine New Zealand, and also Sport Science New Zealand: Programme and Collected Abstracts. The 2002 Conferences of the Australasian College of Sports Physicians, Sports Medicine New Zealand, and also Sport Science New Zealand, Christchurch, NZ, (178-178). 30 October - 2 November, 2002. Hanrahan, S.J. (2002). Mental skills training: Practical considerations for working with athletes with disabilities. In: M. Weiss, The 25th Annual Sport Psychology Conference Proceedings. Motivation in Sport: The Passion Driving Participation Excellence, Charlottesville, VA, (). 24-27 June, 2002. Pre-game expectancies, personal success, team outcome and post-competitive affect: Which comes first? Hanrahan, S.J., Gross, J. B. and Cerin, E. (2002). Pre-game expectancies, personal success, team outcome and post-competitive affect: Which comes first?. In: Organising Committee, Association for the Advancement of Applied Sport Psychology 2002 Conference Proceedings. , Tucson, Arizona, (53). 30 October - 2 November, 2002. Team harmony: Different strokes for different folks? Hanrahan, S.J. (2002). Team harmony: Different strokes for different folks?. In: M. Weiss, The 25th Annual Sport Psychology Conference Proceedings. Motivation in Sport: The Passion Driving Participation Excellence, Charlottesville, VA, (). 24-27 June, 2002. Hanrahan, S.J. (2001). No sleeping allowed: Effective teaching practices for large group. In: Association for the Advancement of Applied Sport Psychology 2001 Annual Conference Proceedings. , Orlando, Florida, (103). 3-6 October, 2001. Hanrahan, S.J. (2001). The relationship between attributions and achievement goal orientations across time. In: A. Papaioannou, M. Goudas and Y. Theodorakis, International Society of Sport Psychology 10th World Congress Programme and Proceedings. In the Dawn of the New Millenium, Skiathos, Greece, (193-195). 28 May - 2 June, 2001. Hanrahan, S. J. and Gross, J. B. (2000). Attributions and goal orientations in masters athletes. In: 2000 Pre-Olympic Congress Book of Abstracts. International Congress on Sport Science, Sports Medicine and Physical Education, Brisbane, (47). 7-12 September 2000. Daw, J. R. and Hanrahan, S. J. (2000). Concentration as an issue for orchestral musicians. In: A. Garton, Australian Journal of Psychology. 34th Annual Conference of the Australian Psychological Society, Canberra, (78). 3 - 7 October 2000. Hanrahan, S.J. and Gross, J. B. (2000). Home advantage: Alive and well in basketball, AFL and cricket. In: A. Garton, Australian Journal of Psychology. 34th Annual Conference of the Australian Psychological Society, Canberra, (86). 3-7 October 2000. Multi-event athletes: What are they thinking? Minniti, A. M. and Hanrahan, S. J. (2000). Multi-event athletes: What are they thinking?. In: 2000 Pre-Olympic Congress Book of Abstracts. International Congress on Sport Science, Sports Medicine and Physical Education, Brisbane, (161). 7-12 September 2000. Hanrahan, S. J. (1999). Games to add life to group sessions. In: Abstracts of the 1999 Conference. 14th Annual Conference of the Association for the Advancement of Applied Sport Psychology, Banff, Alberta, CA, (97). 22-26 Sept, 1999. Hanrahan, S. J. (1999). Mental skills training for athletes with disabilities. In: P. Mayne, VISTA Downunder '98: A View Towards 2000 ... and Beyond. International Conference on Athletes with Disabilities, Canberra, (99-104). 1-7 Nov, 1998. Lewis, K. A., Hanrahan, S.J. and Smethurst, C. (1999). The effect of technical cue words on tennis serve performance. In: Book of Abstracts - Fifth IOC World Congress. Fifth IOC World Congress, Sydney, (70). 31 Oct-5 Nov, 1999. Examination of intervention effectiveness: Pacific Sport Partnership. Research report submitted to the International Cricket Council East Asia Pacific. Mental toughness in the Australian military: Conceptualisation, measurement and development. Youth coach training in mental toughness and its impact on positive youth development. Adaptation to a post-athletic career-The role of transferable skills. Psychological Automaticity: Investigating the Optimal Psychological State for Peak Performance. The effects of performance routines on soccer performance. PHYSICALLY TALENTED ATHLETES: IS THE FIRE BURNING? An Examination of Motivation in Saudi Male Elite Team-Sports Using Self-Determination Theory. Social Identity, Individual Differences, and Alcohol Use in Athletes.